For over 15 years, we have been actively involved in sponsoring children at the Hebron Children's Home, in Palakol, West Godavari District, Andhra Pradesh, India. Jalli Sagar Prakasam is the headmaster for the home. His wife, Suneeta, is the principal for the school. Together they feed, clothe, educate, and care for over 150 children, teaching them about God, the Sabbath and holy days, and living as a Christian in India. In these two verses, Paul speaks of the Corinthian church (and the church at large metaphorically) as a tilled field or a building project. In this endeavor are labourers working in conjunction with God, with the goal of producing a harvest or constructing a building. These labourers are drawn from the very project that is being worked on, the church. “And I entreat thee also, true yokefellow, help those women which laboured with me in the gospel, with Clement also, and with other my fellow labourers, whose names are in the book of life.” (Philippians 4:3, KJV) Those labouring in the project will receive a reward, each according to his own work performance. The productivity of work is not just based on how physically hard one works, but also on how smart one works with the opportunities one has. In the parable of the talents (Matthew 25:14-30), Jesus tells of three servants trusted with resources. Talents here are not abilities, because each man was given according to his ability (vs 15). The talent, a large sum of money, represented opportunities to invest, to be wise stewards of what was temporarily theirs. The expectation, the hope, was each servant would exercise his ability fully to make good choices concerning investment potential and risk. The goal was to make a healthy profit. Wise investors today search for organizations that produce good profit for minimal investment. If that organization’s stock is undervalued because its potential is not yet widely recognized, so much the more the incentive to invest in it. The church, in a sense, is the undervalued stock of the coming Kingdom of God. The world underrates it greatly, but for investors with eyes to see, the return on investment will ultimately be out of this world. However, different branches of this organization, called the church, produce different levels of return at different times. Wise stewardship of the resources God has trusted to each of us strongly suggests we consider carefully what we invest in, that we evaluate thoughtfully the profit potential of where we put time and money. With that in mind, let me suggest what I consider to be a very wise investment, one that is minimal in cost but great in its potential for the Kingdom of God. It is one you might wish to consider for your “spiritual” portfolio. Hebron Children’s Home: A Brief Overview. Location: Eastern India, Andhra Pradesh state, West Godavari District, Palakol town, approximately 30 kilometers from the Bay of Bengal. History: Begun in 1961 by Prakasam Jalli, a teacher concerned with the plight of destitute children. Upon Prakasam’s death in 1989, his son Sagar assumed responsibility for overseeing the operation. In 1995, Sagar and Sunitha married. (Sunitha is a former orphan who graduated from Hebron.) Together they devote their lives to caring for children and people in need. 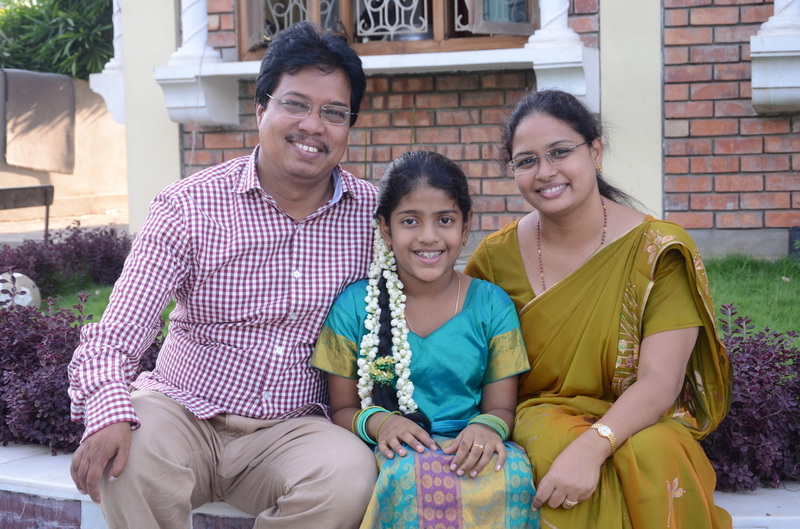 In November 2002, Sagar and Sunitha became the parents of a little girl they named Shiny. Prakasam means “shining” in the Telegu language, Prakasam being Sagar’s father’s name. The government officially recognizes the children’s home and Sagar as headmaster over it, but does not provide funding. The school (associated with the home) also accepts local non-orphan students for teaching. The children’s home is owned and directed by Sagar and Sunitha, and they are dependent on outside contributions for continuation of their work. The facility is located on several acres on the fringe of Palakol (town) and contains both housing and schooling facilities. The age of the children range from very young to 18. The children receive education, according to their ability, from primary level through vocational college. They receive shelter, food, clothing, medical care, and attention from a staff that seeks to give them skills to prepare them for adult life in Indian culture. The backgrounds of those children accepted into the home is varied: some have no parents, some one, others have both parents alive but in such poverty the children could not be provided for. The facility was designed for perhaps 70-80 children, but because of so much need, currently has approximately 200 children. Facilities and resources are stretched to the limit and beyond. It is estimated there are well over 100 million homeless children in India. To be in Hebron is a great blessing. Hebron Children’s Home is a well-established, growing and legitimate charity. This is important; scams involving orphanages and charities abound. Hebron is open for visits from supporters and has graciously received many such visits. One such visit was reported in The Journal in an article written by Bill Stough in 2000. It reports the experiences of Paul Woods of Caldwell, Idaho, Chris Whidden of Forks, Washington, and Keith Kleeschulte of St. Peters, Missouri. The three took a month-long trip in which much time was spent at Hebron. The interview with Mr. Kleeschulte reveals what a light Hebron is in a nation darkened by idol worship. Michael Deering, while in service to a different ministry in India, visited Hebron Children’s Home in 2012. Michael, during his visit to Hebron, took many pictures and videos documenting the excellent work being done there. Mr. Deering provides a powerful authentication of the Christian work being conducted for children at Hebron. Not only are the children taught Christian values, they are instructed in the importance of observing the commandments of God including the seventh-day Sabbath and the seven annual Holy Days. They come to know who Jesus Christ is, and many of them choose to be baptized about the time they are old enough to leave the children’s home. This results in a high conversion rate of the children to Christianity - an important consideration for Christian investing.. In addition to the children’s home, Sagar oversees currently some 30 sabbatarian churches in the general area. The congregations range from approximately 30 - 100 people, some with pastors who graduated from Hebron. Also, a widow ministry is conducted as funds provide, distributing blankets, utensils, food, and other needed items. A nearby leper colony is also supported at times, depending on donations. The ministry of Hebron is a bright Christian light in that area of the world. It is growing and producing fruit. This article is presented to inform more Christians of a fruitful work they might wish to invest in. For more information, contact the Church of God Faith Fellowship in Missouri. You can participate in feeding, clothing, sheltering, educating, and providing a positive influence to a needy child for an amount of your choosing. You can also contribute to church support, widow ministry or the children’s home with any amount at any time. Donating through Church of God Faith Fellowship means 100% of your donation goes to the Hebron ministry. Nothing is taken out for operating costs or fees. There is no obligation except the desire to participate in a fruitful work of God, where the name of Jesus Christ is boldly proclaimed. Ecclesiastes 11:2 says, “Give a portion to seven, and also to eight; for thou knowest not what evil shall be upon the earth.” Diversifying your investments, even in the kingdom of God, is probably a wise choice. You have the opportunity to participate in a labour that may be very rewarding when God comes to pay His labourers.